Welcome to http://www.chicagobar.org (the “Site”), a web site provided on behalf of The Chicago Bar Association (“CBA”).The Terms and Conditions of Use include any posted guidelines or rules applicable to particular Content or Services (as defined below) and, as updated by CBA from time to time, are collectively referred to as the “Terms and Conditions” and govern the use of the Site. You should carefully read the Terms and Conditions before using the Site. You can review the most current version of the Terms and Conditions at any time at http://www.chicagobar.org/AM/Template.cfm?Section=Terms_and_Conditions . By using the Site, you: (i) agree to be bound by the Terms and Conditions; (ii) represent and warrant that you are at least eighteen (18) years old; and, (iii) represent and warrant that you have the legal authority to accept the Terms and Conditions. This is a legally binding agreement. If you do not agree to the Terms and Conditions, you are not authorized to use the Site. In the event of a conflict between these Terms and Conditions and any posted guidelines or rules applicable to particular Content or Services, the posted guidelines or rules shall govern to the extent of such conflict. You understand that the Site may provide the capability to upload, post, or transmit images (such as your photograph or other graphics) to third party users through the Site (collectively, “Images”). You authorize CBA the right to copyright, license, publish, broadcast, display, reproduce, and distribute in any manner the Images. You understand that the Images may be altered, adapted, or modified in connection with such use, and that your Images may be used alone or in combination with a fictitious name. You understand that you will not receive any royalties or other reimbursement for permitting CBA to use the Images. You grant CBA and other users the absolute right and permission to use, re-use, publish, and re-publish Images, with or without your name, or reproductions thereof or excerpts therefrom, made through any medium, and in any and all media now or hereafter known for any purpose whatsoever. You also consent to the use of any printed matter or other photograph or artwork of any kind without any restriction or limitation thereon, in conjunction therewith. You also understand that you will have no copyright or other rights with respect to the Images as they are used by CBA or users. You hereby release, discharge, and agree to hold harmless CBA and any users, from and against any and all claims and demands, including but not limited to, any claims for copyright infringement, defamation, invasion of privacy, or right of publicity, arising out of or in connection with any use of the Images. The Lawyer Referral Service on this Site is provided as a public service. 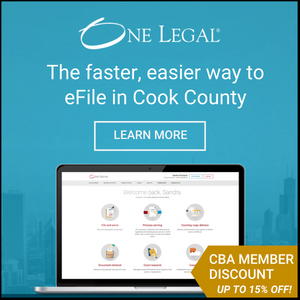 Users of the Lawyer Referral Service agree to be bound by the applicable terms and conditions, as stated at http://www.chicagobar.org/AM/Template.cfm?Section=LRS_Terms_and_Conditions. Email: tmurphy@chicagobar.orgTo file a notice of infringement with CBA, the requirements specified in Title II of the Digital Millennium Copyright Act of 1998 must be fulfilled. The text of this statute can be found at the U.S. Copyright Office web site, located athttp://www.copyright.gov. CBA may change the Terms and Conditions from time-to-time. If such a change is made, CBA will post the revised Terms and Conditions on the Site. CBA reserves the right to add to or change the Site or cease offering the Site (or any Content or Services on the Site) at any time and without liability. CBA reserves the right to refuse to offer access to the Site to anyone at anytime without notice.